The current data revolution has made it an imperative to provide more people with access to data-driven insights faster than ever before. That’s not news. But in spite of that, current technology seems almost to exist to make it as hard as possible to get access to data. 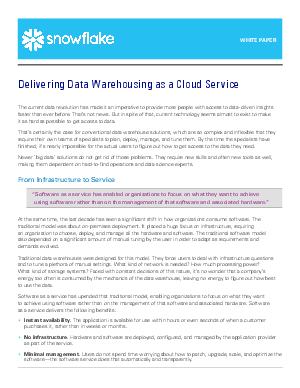 That’s certainly the case for conventional data warehouse solutions, which are so complex and inflexible that they require their own teams of specialists to plan, deploy, manage, and tune them. By the time the specialists have finished, it’s nearly impossible for the actual users to figure out how to get access to the data they need.